As Brian Turner CBE has often said, ‘Nothing can prepare you for the Bocuse d’Or’ and he’s absolutely right. It is a contest like no other and I certainly hadn’t prepared for how the experience would affect me. I went into the competition expecting to be overawed by five and a half hours of intense cooking but I actually really enjoyed it. Instead of hours of pressure, what I experienced was five and a half hours of pure, controlled adrenaline. I think that the fact that we now have a replica kitchen to practise in provided the additional comfort and I hope that future Bocuse d’Or candidates will benefit from this fantastic facility. I can’t thank UCB enough for their support with this. Competing in Brussels and being judged by some of Europe’s best chefs, gave me a real buzz and I can understand why chefs like the current title-holder Rasmus Kofoed have returned time and time again. The heats helped me to mentally unlock my approach; cooking in the Bocuse d’Or is so far removed from cooking in a restaurant that you have to totally free your mind from the day job. Preparing for Brussels was difficult in that I struggled to get my head around what was required in terms of logistics and timings. Now I’ve experienced the heats I have a clearer idea for what we need to do for Lyon. We also had the additional confidence boost of winning the special meat prize which came as a complete shock. I wasn’t listening out for our names at this point, which I think you can see from the photo. Fortunately, my wife is very supportive of me taking part in the competition, as it does take over your personal life. She’ll be coming out to Lyon with our three year old daughter, which will be quite an experience I’m sure. I’m also lucky to have a boss (Andreas Antona) who is 100% behind me taking part and is happy to give me time out of the Simpsons’ kitchen to prepare for the competition. 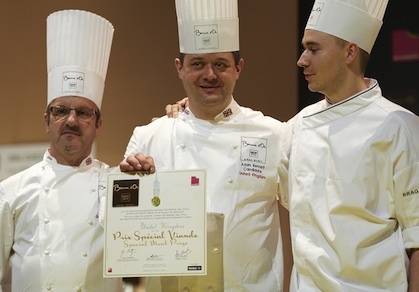 The Bocuse d’Or is not a level playing field and achieving success requires the support of a wider team. In the run up to Brussels, we had a great response from businesses who wanted to help our cause. I hope that everyone will join us in the next challenge, competing against the rest of the world in Lyon!